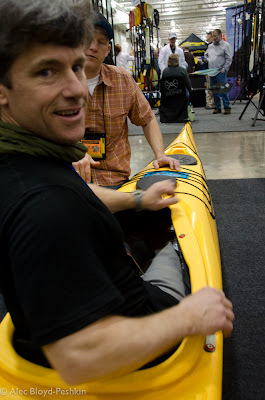 We often talk about paddlesports being a small world. 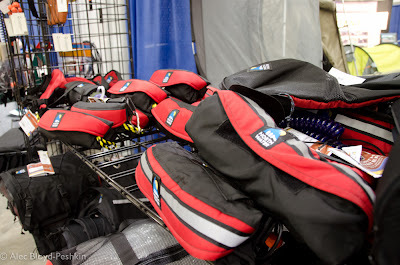 But when most of the major manufacturers of boats, paddles, clothing and gear, along with clubs and organizations, outfitters and publications, come together under one roof in March, it feels pretty big. Add more than a hundred presentations in meeting rooms and a swimming pool, and more than 20,000 visitors, and Canoecopia earns its claim of bring the largest paddlesports consumer event in the world. Dusting off a canoe before the crowd comes in. 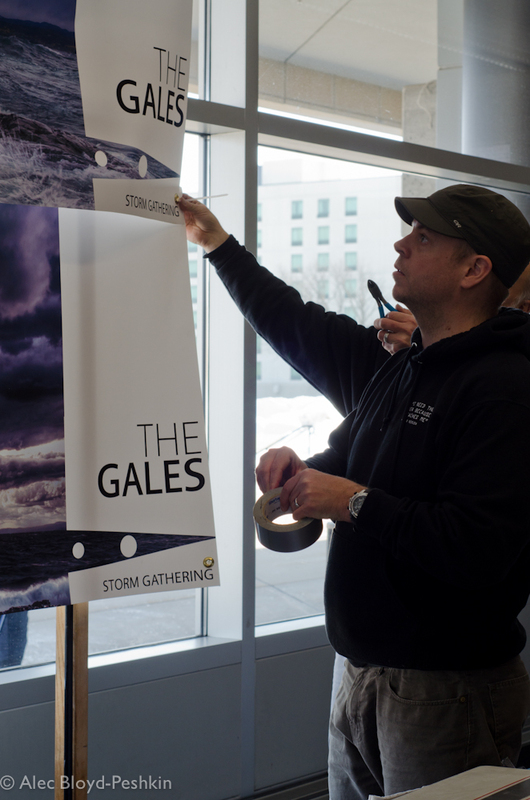 We arrived early this year to help set up a table for The Gales Storm Gathering, the intermediate/advanced, bumpy water sea kayaking instructional event that will be held October 11 to 13 in the Apostle Islands. Keith Wikle taping the new banners behind the booth. Scott Lynch explains the construction and features of the Glacier Trek spray skirt. Durable Snap Dragon skirts feature a one-piece spray deck and graduated levels of bungee tension depending on the model you buy. We were double agents (at least--perhaps quadruple agents) at Canoecopia this year. 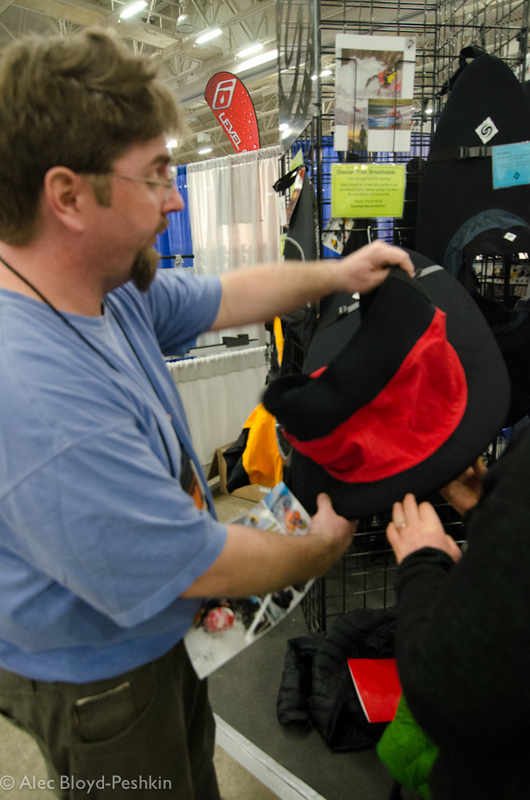 We were vendors in the Snap Dragon booth, exhibitors at the Gales and CASKA tables, speakers at the swimming pool, and customers eager to soak it all in. And there was a lot to absorb. As usual, we prowled the aisles looking for new products and innovations. 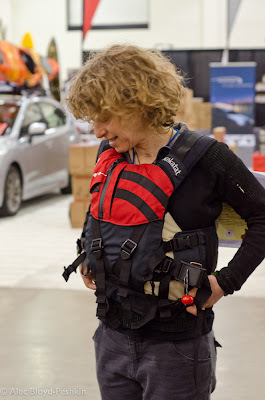 Sharon tries on the new Kokatat Maximus Prime PFD, a whitewater rescue vest that really fits smaller paddlers (and larger ones, too). This vest has especially wide shoulder straps and webbing adjustments in the front, making it easier to get a snug fit, even on a short torso. Level 6 offers a Creek Boot with a wide toe bed and a grippy, flexible and sturdy sole. 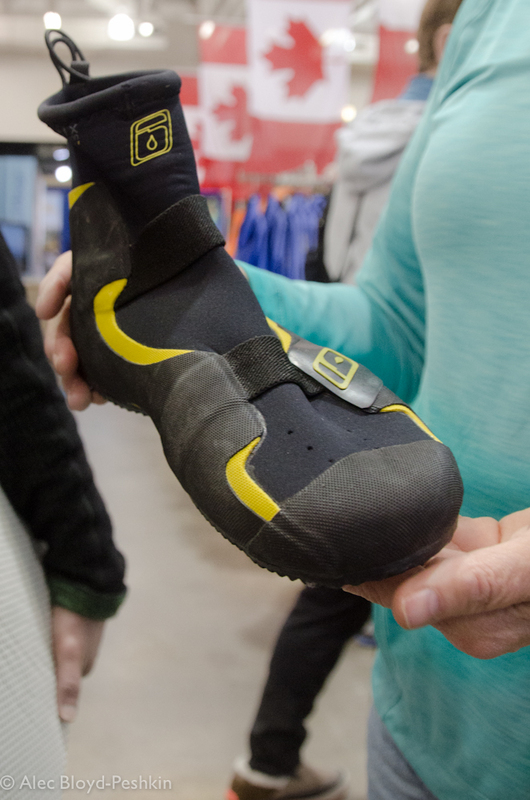 Designed by Level 6 co-founder and Canadian Slalom Team racer Stig Larsson, it's slim enough to to bend and fit in a boat but sturdy enough to protect your soles during a portage. North Water offers the tow systems preferred by most of the top paddlers and coaches in North America. Alec checks out the P&H Delphin 150, which launched a new category of sea kayaks designed to excel in surf and play spots. 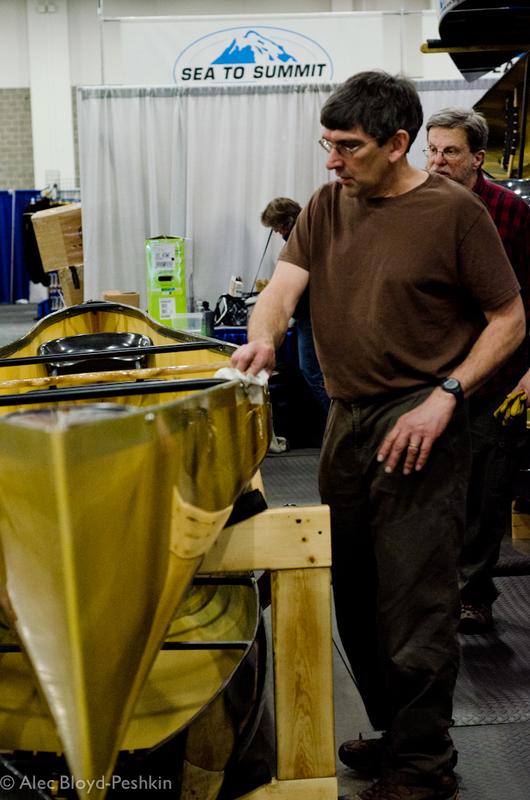 Canoecopia also offers a rare opportunity to talk with the designers, sales managers and often the founders of the companies that make the boats and gear we use. It's a chance to hear talks by and engage in conversation with all kinds of paddlers on all kinds of topics. And even though we always say there's nothing more we need, we end up buying something new and exciting. This year it was kneeling pads and painter rope for our canoe, and one new shirt apiece. We'll be back next year. Nice wrap-up. It seems like a small world with all the people I ran into at Canoecopia. But, what it comes down to is this: Canoecopia and kayaking have introduced me to a much larger, more fun, world. Well put, Lenore. Nice to see you there this year!